Another Ashes series looms... What do they say in modern parlance? OMG. Oh my God... I’m probably getting older and these series seem to come around far more quickly than they used to when I was younger and, with every series, the hype seems to start earlier than other series. Cricket books abound both before and after the series and before the visiting side seems to have left for home. Yet I was delighted when Rachel Nicholson from Carlton Books readily agreed to my polite request for a review copy of The Official MCC Story of the Ashes. Yes, I’d asked for it and the reason being that, with its title including MCC, my curiosity was aroused and I suspected that this might be a good read and reference book. I am fortunate to be a member of the MCC and a reasonably regular visitor to the MCC Museum where, amongst other departments, Adam Chadwick and his staff have done sterling work. Bernard Whimpress is a well-known Australian writer and former curator of the Adelaide Museum and so the book promised much. I am much impressed with the end result. With so much input from the Lord’s Museum, this chronological book naturally gives a potted history of each series but has the added impact of artefacts used during certain series. The balls with which Jim Laker and Bob Massie wreaked such devastation at Old Trafford in 1956 and Lord’s at 1972 are pictured as are the changes of headwear used from the earlier days to the current. It isn’t only about the cricketers either as broadcasters and writers have chapters devoted to them. The photography is naturally impressive. There is no need to be put off by the introduction’s title “ The Prize that Began as a Joke” but it sets the scene on how the most famous cricketing trophy began. This is an excellent and eminently collectable book with the right amount of coverage given to the individual series but made that much more special by the included memorabilia. 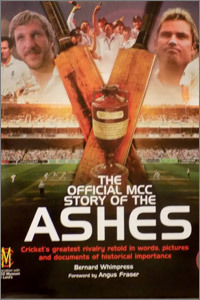 Given also that England travelled overseas at the MCC until just over thirty years ago, The Official MCC Story of the Ashes is a most fitting tribute to this most famous of cricket series. This may also be a useful time to encourage Lord’s visitors this summer to visit the Lord’s Museum just behind the famous Pavilion. The theme changes regularly to match that year’s visitors and, of course, the little urn, the most famous symbol of English and Australian cricket, is there.